Netflix’s anime catalogue has been a curious grab-bag of titles old and new, licensed and produced (but confusingly all called “Netflix Originals” regardless), action and comedy, realistic and fantasy… and good and bad. No-one could argue though that last year’s Castlevania was definitely a hit over a miss. A short and sweet four-episode miniseries that left a clear hook for ongoing adventures, audiences were clamoring for more and before Halloween this year Netflix duly obliged with an eight-episode follow-up – called a “second season”, but as the two together form a standard twelve-episode cour all telling a single continuous story it’s really just one series. Does it make for a lovely present to its fans tied off with a bow, or is it belatedly proof that you can have too much of a good thing? Castlevania continues immediately where we left off at the end of the first season. In the fearful and superstitious era of medieval Wallachia, Dracula knows how to exploit those terrors of the night for his dark power. He is leading a demon army to eradicate the human race. After his human wife was burned at the stake as a witch he has vowed a terrible, annihilating vengeance upon the entire world. The only ones who can stand against Dracula – Son Of The Devil, King Of Vampires, and all the other curses accrued over centuries of stalking the night – are the vampire-hunting clan of the Belmonts. Unfortunately, this is a problem when the family has fallen from grace and its last remaining member, Trevor Belmont, is a homeless drunk. Monsters battering down the door have quite been a sobering influence however and he has teamed up with the magical mystic Sypha and Dracula’s son Alucard – who opposes his father’s genocide because he knows that his mother would never have wanted such an awful act done in her name – to storm and finally bring down Dracula’s castle. This will be a ferocious challenge, because Dracula has assembled some of the strongest vampires from across the entire world to lead his forces, but while they may all be soulless abominations, being damned together does not make them united in purpose. 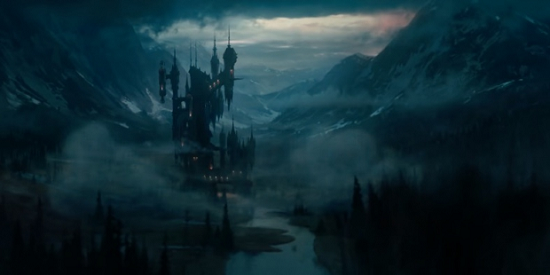 There is scheming and plotting afoot in the lonely garrets of Dracula’s Haunted Castle, but if Dracula’s plan is undermined by his own generals that may only unleash an even more awful darkness. Can Trevor discover the power in himself to ensure that there is a new dawn? Castlevania is not strictly-speaking an anime – it’s an American production with a largely English-speaking team behind it – but with its stylistic inspirations and its adapting a Japanese videogame series it’s clearly sufficiently adjacent to be seen in a similar spirit. The story – written by major comic book supremo Warren Ellis – offers a broad encompassing view on the whole Castlevania series, centring on a loose take on the setting of 1989’s NES platformer Castlevania III: Dracula’s Curse, including a number of character and story elements from the 2005 Playstation 2 game Castlevania: Curse of Darkness, and taking some visual inspiration (especially in the character designs of Dracula and Alucard) from the genre-defining 1997 classic Castlevania: Symphony of the Night. Ellis’s mark on the series is… inimitable. There have been a number of departures from the source material which have got game fans in a froth (for instance, the pirate Grant Dynasty has been cut altogether as Curse of Darkness villain Isaac has undergone a radical redesign) but I don’t object to the changes – indeed, I'm pleased that the Symphony of the Night influences are only peripheral, as that game overshadows the whole series so it's about time some other entries in the saga got a look-in in the popular consciousness for once! Castlevania III was a simple and uncomplicated game in terms of story so it naturally needs some embellishment. Arguing over minutiae is a futile exercise, because ultimately the only thing which would be “truly faithful” to the videogames would be for the show to be nothing but a recording of someone playing the actual game… and even then you’d have someone grinding his teeth that it wasn’t a perfectly efficient no-damage world-record speed-run. Many of the complaints about ‘lore accuracy’ come from utterly un-pleasable gate-keeping groups which have determined from the outset that they are going to oppose anything popularising and having others intrude on their corner and will work back from a pre-established conclusion to find any nitpick to confirm it. Even if a lot of the carping from the sidelines can be safely dismissed as white noise, though, that’s not to say that no legitimate criticisms at all can be made of season two of Castlevania. Much like Warren Ellis himself, this show is very… uneven. Some dialogue is scintillating – the first confrontation between Dracula and his scheming lieutenant Carmilla rings like a flawless crystal with the sharpness of its dry irony as each vampire is fully aware that they are being insincere to each other but as monsters understand they hide their evils behind an ill-fitting human mask; but on the other hand, Ellis’s clunky attempts at Ribald Earthy BanterTM between the heroes are frankly cringe-worthy. The first series was quite embarrassing for having peasants that grunted about sheep-shagging in one line and then condemned Trevor with impassioned eloquent hellfire in the next, and the same confused tone is present in a few of the dialogues here too. Some characters are subtle (Isaac is homosexual, but he’s not a mincing queen about it) whereas others like Viking vampire Godbrand announce to the world that they’re cartoons. While it’s clear that Ellis has genuine passion for the setting with multiple shout-outs to the games (both prominent ones with monsters from the games appearing as enemies in the show, to subtle references like Castlevania: Order of Ecclesia symbology in the books at the library which show good attention to detail) there is a significant amount of writing which comes across as frankly plain hackery that’s inexpert at best and lazy at worst. 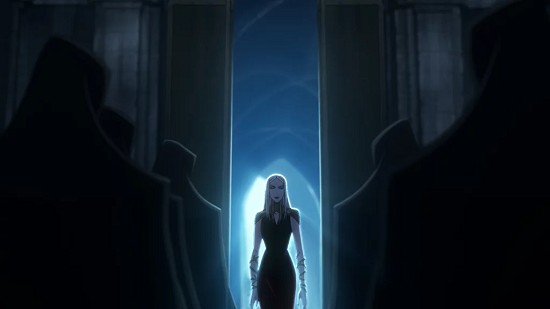 This is most obvious in the Corrupt Church subplot – although it’s less prominent in the second season than the first there is still a strong element of it when the season opens with a flashback where the evil ranting bishop arrests Dracula’s wife despite her repeated entreaties that she’s studying “science”. I said earlier that I don’t mind the series making adjustments to fill out scant source material, but like the difference between the letter and spirit of the law if you’re going to be countermanding the theme then why even use the brand? The whole enlightenment-versus-ignorance sequence not only just doesn’t fit Castlevania where holy warriors wield visible magic on the church’s commission to fight literal raised-from-Hell demons, I am only left wondering why there are so many Roman Catholics in Romania, which is an Eastern Orthodox country! It just seems that Ellis thinks that any Christian references must be accompanied by the corrupt church trope as if he’s slotting in an off-the-shelf plot device and can’t let go of the security blanket of the reliable and predictable antagonistic church, like so many other cool rebels on the edge, even where it doesn’t belong. Unevenness implies positive as well as negative - while there is some writing I dislike there’s other parts that I admire. The depiction of Dracula as a despondent nihilist craving his own annihilation as much as those of his enemies is a compelling and nuanced characterisation, uncommon in the many versions of the character we’ve seen over the decades, and a rightful centrepiece of the series that is given actorly heart by James Callis (Battlestar Galactica’s modern Baltar). While initially I disliked it – it seemed incongruous that the demon that appeared as a raging pillar of fire swearing to unleash hell on the foolish mortals in season one now spends most of season two moldering in his study – on reflection I came to understand and appreciate it as a fire that has since burned out, and genuinely seeing no value in anything anymore and truly understanding the desolation and isolation that is the terrible consequence of immortality. Even the war on humanity itself is just mechanically going through the motions – he lashes out in revenge because that is what hell-beasts who do not comprehend God’s mercy are expected to do. Dracula’s a handsome chap though so in his funk he appears poised and austere, not sniveling and pathetic. Centuries of ennui that were relieved by the atypical courageous fascination of his human wife Lisa rolled back into him like a tide following her death, drowning all that he hoped for the future – but as can be seen when the Belmont crew’s attack on the castle lights a fire in Dracula’s belly again, he needs a physical challenge to stimulate him as much as Lisa gave him an intellectual one. Those physical challenges are formidable, too. Castlevania will be remembered for phenomenal action sequences. Trevor, Sypha and Alucard form a complementary trio of spectacular skills – Trevor’s scourging of demons with his whip is hypnotic in how it enmeshes the screen with a dizzying snake of twisting loops and knots before it darts in with an asp-bite to lash the foe with its forked tip; Alucard’s precise, clinical, academic and cultured way of war is as penetrating as a laser; and Sypha’s pagan pyrotechnics boil and seethe with elemental fury. The sheer cinematic splendor of these fights are a sight to behold with real directorial flair and panache. There’s even some storytelling integrated into how they fight – for instance, the power of the Belmont family’s legendary Vampire Killer whip is made powerfully apparent by its literally explosive impact on the undead, communicating the significance of this sacred artefact without needing half an episode of exposition reciting the plot of the Castlevania: Lament of Innocence videogame. Unfortunately once more the show gives with one hand only to take with the other. Fight scenes are superb but their presence is very erratic. I am not just unhappy at not being bamboozled by superficial graphical frippery, this does undermine the emotional drama as well. The vampires under Dracula are unhappy with his lack of strategy and distant leadership, leading to their war against mankind being “confused”. However, why do they need strategy at all? It’s made clear that the legions of Hell are utterly unstoppable and no-one except the Belmonts can stand against them – and as they are researching Dracula in the family library for most of the season and completely isolated from the war. Strategy is redundant when you’re effectively omnipotent, so a lot of the scheming between the vampires does not feel like vital, desperate conspiracies but entirely pointless. There doesn’t even seem to be much sense that there’s a war on at all – when we visit human settlements their residents are happily going through their ordinary routines entirely unconcerned about the blood raining down from the sky and screams of the fiery abyss that are just down the road. What happened to the embattled, besieged towns like Greisit in the first season? Individual fights are good then but they’re disconnected random encounters on the world map, there’s palpably no sense of danger from them in context. I hesitate to use the phrase ‘poor pacing’ because that’s one of those vague, non-specific, amateur criticisms you see on comment threads that people thus reflexively dismiss as meaningless but it really does apply here. There should have been an episode, or at least a montage sequence, of the Belmonts helping to fortify towns and organise counter-attacks against the attacking demon armies on their way to the family library, turning the brief one-off scene of Trevor helping the Greisit townsfolk back in season one into a system of resistance that would have shown that there’s actually a meaningful war on, establish our protagonists’ heroism, and show visible defeats that would have provided stakes for the other vampires to thrust at Dracula’s poor control. For all the taut direction of the action sequences there’s also a tragic stumble at the very climax when the Belmonts finally mount their assault on Dracula’s castle. The actual fight itself is fine (where a group of vampires fighting among themselves suddenly freeze as they see Trevor and then ignore their previous division to gang up on him coolly shows the awesome strength of the Belmont legend) and is accompanied by the classic Castlevania theme tune and series motif “Bloody Tears”; unfortunately what should be a thunderclap of fan-service comes out with a whimper when a too-low sound mix makes it barely audible, so as you’re hyping yourself up for a barnstorming, foot-stamping, fist-pumping rock-out smash it only fizzles out. Other elements of the vampire conspiracy storylines also misfire. Carmilla’s attempt to get one of Dracula’s servants to betray him by implicating him in a conspiracy is nonsense when there’s nothing stopping him from just walking into Dracula’s study and telling him everything Carmilla said; that Dracula’s own son opposes his plan is dismissed with barely a shrug. It all feels under-cooked. The one thing that Castlevania certainly cannot be criticised for is its artwork. The show looks absolutely stunning in both background and foreground art and animation and I honestly struggle to find anything to fault. It’s a little disappointing that there’s not more of the Belmonts getting lost in the Haunted Castle’s insane non-Euclidian geometry seeing as exploring the castle is such a big part of the games, but that’s a minor gripe as what we see from the patterned carpets to the melted engine room to its quiet Carpathian mountain hold is detailed and artful. The lonely ruins of the Belmont estate and the hidden palace of the library in the catacombs beneath are redolent with a saga of lost splendor. The Castlevania games have certainly grown baroque as the series has progressed from its humble 1980s NES roots and the show does justice to that growth in lavish style. Care has been immersed into the characters, which stay detailed and complex in their designs even during busier scenes. It’s actually a real shame that all the episodes of the second season after the first only show an abbreviated title sequence because the opening credits shown in the first episode are an absorbing and organic flow of pencil-sketched fire that is fascinating to watch and I’d have been happy to see in full each time. Even company idents, where Powerhouse Animation have done theirs up in a retro-pixel style like one of the old games, are a nice touch. Castlevania is already an official success – at the time of writing Netflix had announced that they had commissioned a third season and as the last episode of this second season is entirely about setting up plot hooks for a sequel (producers have talked about creating a “Castlevania Cinematic Universe” of sorts) it was probably always on the cards. I have given the show some hefty criticisms in this review but nonetheless I would still like to see what that third season has to offer. For all its problems the show does have incredible production values and appears to have been made with real heart, even if that heart has made it overlook a number of scrappy errors and bloated flaws there’s a beat of enthusiasm there that with a tighter script in the third season should get the blood pumping. Great art with scrappy writing make for a flawed but fascinating show.